Across the internet, in photos, on magazine covers and jewelry pieces, we see the elephant honored and admired by animal lovers around the world. If you have ever had the chance to watch baby elephants splashing around with their mother in a pond, you have probably fallen in love these remarkable beings. Unfortunately, for most of us the only time we likely have ever interacted with elephants is during a visit to the zoo. As it is so important to connect with animals that we may never have the chance to see up close, it’s a gift to be able to understand and observe elephants, including threats to their well-being and survival, in the new documentary Love and Bananas produced and directed by Ashley Bell, distributed by Abramorama. Bell originally travelled to Cambodia with longtime friend, David Casselman, to watch the release of the first two rescued Asian elephants onto Casselman’s sanctuary. . Bell went on the trip to fulfill a lifelong dream of seeing an elephant in person, however her trip uncovered the harsh reality facing elephants that Bell had never known. She decided to make a film about all that she was seeing and experiencing, to share her love for elephants and to make people aware of theharm they face under current treatment and threats in the region. Watching elephants walk freely for the first time in Cambodia drove Bell to learn about the plight of Asian elephants and the loss of their habitat. 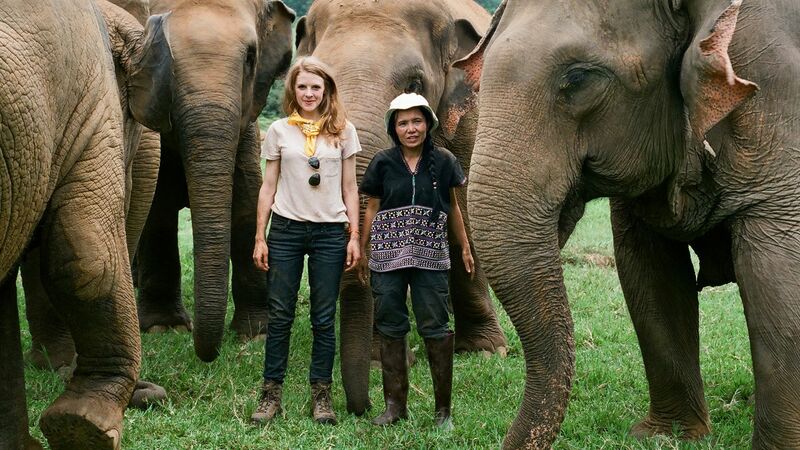 As a part of her investigation, she was introduced to Lek Chailert, a woman who has dedicated her entire life to elephant conservation. Originally from a family deeply involved in the business of keeping elephants for tourism or illegally selling their body parts on the black market, Lek left her family to start the Elephant Nature Park, a sanctuary dedicated to protecting elephants and their habitats. In the film, Lek reveals the chilling and horrific secrets of the elephant “business.” The illegal trade has placed high values on various elephant body parts like ivory, trunks, and even even skin. Additionally, elephants in Southeast Asia are often misused in the tourism industry to give visitors rides on their backs or put on shows that involve standing on balls or painting. In Love and Bananas, Bell captures the incredible journey of Lek and one elephant on a 500 mile, 24-hour drive across Thailand. The elephant, named Noi Na, had been owned by a company that misused elephants for tourist rides and entertainment. Lek coordinated an agreement with the owners of the company to release Noi Na to the Elephant Nature Preserve, which led Bell to fly across the globe at the drop of a hat to document the miraculous journey. The long drive in the back of large truck with Noi Na in tow was physically and emotionally taxing on everybody involved. Noi Na was at risk of heat stroke, but the crew worked around the clock to keep her comfortable. After an entire day and night spent in the truck, Noi Na was released into the Nature Preserve. She walked without chains around her feet for the first time in her life, and enjoyed the company of the other elephants at the preserve. Noi Na’s journey is a beautiful one that we can all learn from. Coming from a life of captivity and abuse, Noi Na now lives freely among other elephants like herself, thanks to Lek. People like Lek inspire us to practice active compassion for all living beings, and to be conscious of how our mistreatment of animals for our own “entertainment” is something we cannot allow. Chimpanzees and elephants are just two examples of species that suffer in poor conditions for entertainment and are being killed for the illegal wildlife trade. Though they are two examples, all animals deserve happy, safe lives with time outside, living with others of their kind. The film Love and Bananas shows us the power of one individual motivated to create a haven for animals to live freely, and how important it is for us to consider our decisions, especially in regard to animal tourism and wildlife trafficking. We must always remember to be conscious of how our decisions impact animals and their habitats, and of course, always make room for love and bananas! Previous ArticleDr. 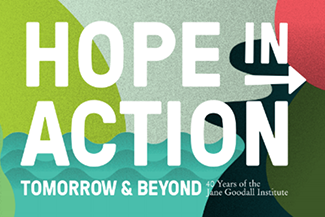 Goodall Broke Boundaries in Science – Now You Can, Too!